The Walking Dead: Michonne got off to something of a slow start, which means Telltale hits the opposite problem in the game's second episode. Shacknews takes a look at Give No Shelter. The following impressions represent our ongoing review of the full The Walking Dead: Michonne series. Be sure to catch up with our impressions for In Too Deep. 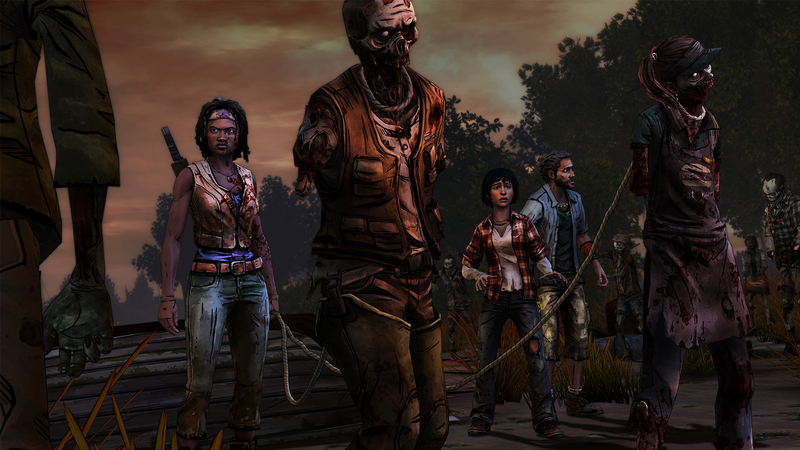 The Walking Dead: Michonne gave me some pause when I initially completed its first episode. The story felt plodding and the overall experience felt like a slow setup, which wasn't quite what I was expecting from a mini-series with only three episodes. But while In Too Deep felt like a slow setup, Give No Shelter picks the story's premise up significantly. Unfortunately, the story's three-episode setup means there isn't a lot of time to marinate on the game's more engaging narrative beats. Give No Shelter picks up where the previous episode left off, with life and death of a supporting character hanging in the balance. Unfortunately, there isn't much that comes of this development, as this character moment is tossed to the side to set up Michonne and Pete's escape from Monroe. And honestly, that statement can pretty much sum up my feelings of this episode in a nutshell. There are things that happen and while they show potential for exploration or introspection, they invariably get set aside, because the story needs to move forward quickly. The pacing feels rushed and that does Michonne's story a disservice, because while the first episode didn't particularly grip me, this second episode showed me the kind of engaging story experience that Telltale can give this character. More than that, it barely leaves any time for character development and that bodes terribly for both the supporting cast and the series' villains. Give No Shelter barely glosses over Norma's character and doesn't expand on anything beyond the brief exposition from the first episode. It's hard to get a handle on her character and whether she's a malevolent caretaker or whether there's more to her character than meets the eye. This potential is only briefly glossed over, as players can see a brief glimpse of a character that does what needs to be done for survival, but has to do so in spite of her homicidal brother and his reprehensible actions. Speaking of which, let's take a moment to talk about Randall. It's hard to imagine there really being a one-dimensional villain in a world as complex as the one in The Walking Dead. Even a butcher like Negan has his reasons for what he does. And honestly, there's probably some strange rationale behind Randall's actions. But because there's only so much time for this story, there's no chance to explore Randall's character and he ends up as probably the most absurd, mustache-twirling, "evil for evil's sake" character not just in this game, but in probably all of The Walking Dead. Randall really does come across as someone that truly enjoys murder and inflicting pain and misery and while exploring that kind of character can be interesting in itself (after all, cold-blooded psychotic killers can roam loose in this world, too! ), there isn't a lot of time devoted to exploring what makes Randall who he is. Instead, it's villainous monologues and, boy howdy, he sure does love to kill people. Give No Shelter's big positive is that it treats the title character right. While the first episode offered a glimpse at what it is to be Michonne, Give No Shelter's story fully goes into what makes the character so memorable. Whether it's the throwback to people's first impressions of the character (the way she escapes a herd of walkers should bring back some memories) or her dynamic with Sam's family, this episode is a stark reminder of what makes Michonne such a powerful character in this world. In fact, the dynamic with Sam's family was the major highlight, essentially allowing players to explore Michonne's psyche through a surrogate family caught in the middle of hell. But like everything else in The Walking Dead: Michonne, this moment is all too fleeting. The Walking Dead: Michonne has been billed as a mini-series and Give No Shelter will certainly feel it, given how briskly the story moves. There are powerful decisions to be made, particularly one at the end, and the stakes feel higher here than they did in In Too Deep. But all too often, this episode felt like one big rush towards an epic climax, skipping much of the storytelling substance to go straight to the game's fireworks factory of a finale. If nothing else, at least Telltale has set up what should be an action-filled final act.